Wow, talk about genetically modified food. A BLUE strawberry? Crazy stuff. 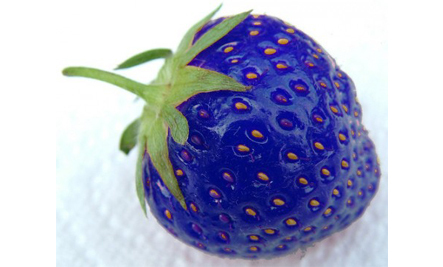 It seems the goal wasn’t to create a blue strawberry, but rather, one that would be resistant to freezing – which this one is – and the color was just a side effect. Scientists took the gene that makes a type of antifreeze in flounder fish, and added it to an otherwise normal strawberry planet. This abomination is the result. This GMO field is one that really scares me…I recognize we may require widespread adoption of GMO in order to feed growing populations, but I’m concerned about the unknown side effects of creating living organisms like these. Read more over at Care2.